So I've succumbed to a recent obsession with zebra-print. I don't know exactly what started it, but it's sort of wiggled it's way into various parts of my home decor and personal fashion. When it comes to the Texas country interior style, similar to what we have in our home, it's easy to get overloaded with brown and tans and solid colors. I've said it time and again, and I'm currently looking for ways to break up the repetition. 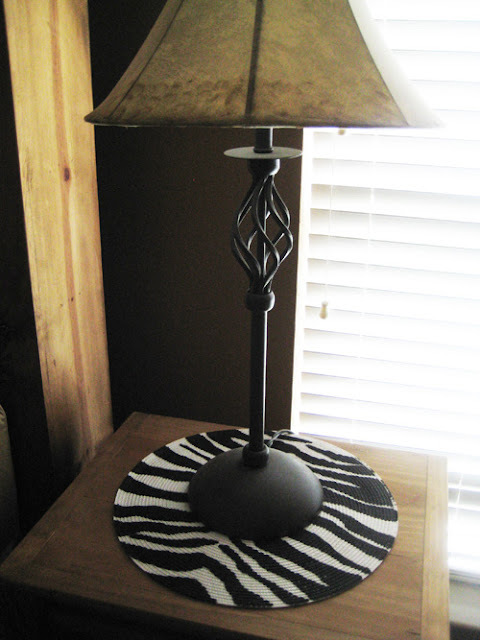 I spotted these small zebra-print lamp shades at Stein Mart in the clearance section. With my 40% off coupon, they were only $1.40 apiece! 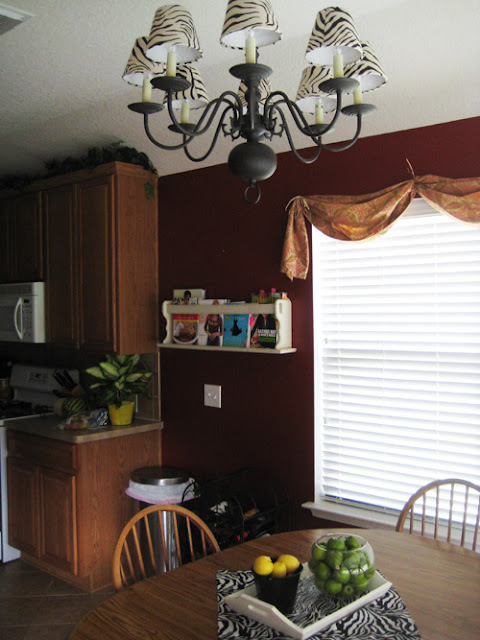 I replaced the tan faux leather shades that were on the kitchen light fixture with these and love the variation they bring into our small eating space. I also decoupaged an old tray I found at an estate sale with zebra print paper. The zebra-print fabric is a .99 cent buy from Hobby Lobby. I thought it'd be fun to tie the whole theme in from ceiling to floor! In our bedroom, I brought a little zebra in with these plate chargers I found at Garden Ridge Pottery for $3 each. Our room has more brown and tan in it as well, so I'm working to add a little more color and variation and I like that these chargers liven up the bedside corners. What are you obsessed with these dayzzzz? I was at your favorite store yesterday and saw some zebra print stuff and I immediately thought of you. I'd never get that by David. Love your zebra stuff! Using the plate chargers inthe bedroom is a fantastic idea!! What am I obsessed with? Shabby Chic! Refinishing furniture using the distressed method! I absolutely LOVE it!! Started redoing piece one of an Ethan Alan set to use for our TV and some storage in our bedroom. I love zebra print! Your place is looking so cute! You make me want a house so bad!